When I was a child in the 1960s I had a number of collections. Not uncommon for boys in that era. I collected coins, stamps, butterflies, fossils, and sea shells, plus some other odd things. The stamp collecting went particularly well because in this matter I was favored by my father. He had retired from the Marine Corps, where he worked intelligence, and began working at Sealand, a shipping company. After finishing college (on the GI Bill) he would work days as a high school teacher, and nights and weekends at Sealand as a clerk. I seldom saw him, but knowing I collected stamps he started bringing foreign stamps home from work. Sealand was already a global shipper. I mostly just stuck the foreign stamps in envelopes. Visiting my parents after a long interval, I was asked to remove anything from my childhood that remained in their house. I was surprised any of it had been saved, but then my mother was a pack rat. I shipped some things home and took other stuff to the local dump. Among the things shipped home was the stamp collection. Who knows, I thought, there might be something of some value in it. A few days ago I finally got around to looking at it. 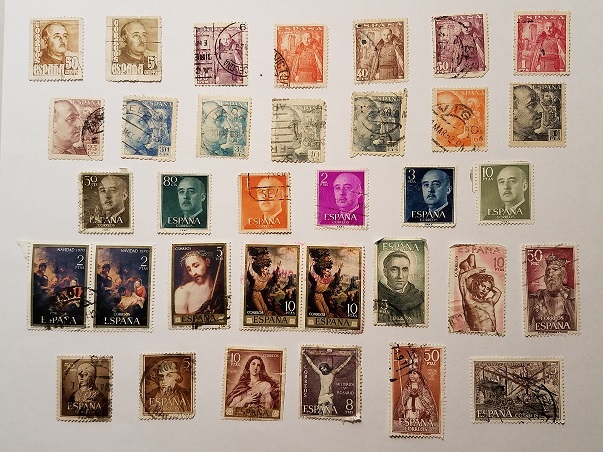 So far the most valuable item I found might sell for $5 on ebay, but most of the stamps, even older stamps, are not worth the price of shipping. What I did find of interest was an envelope marked Spain. I thought: was General Francisco Franco, the fascist dictator, still alive in the 60s? Why yes, he was born in 1892 and died, still in power, in 1975. I opened the envelope and their were stamps of a bald man in many denominations. It was Franco. There were many stamps with religious and historical themes as well. The first three rows are stamps with images of the Dictator, or Generalisimo, from various eras. You can follow the inflationary postwar trend by noting the denominations issued. Starting from the fourth row, on the right, are: the adoration of the baby Jesus; Jesus with crown of thorns; Saint Francisco of Assisi; Sto Domingo de Guzman or Saint Dominic (the order he founded ran the Inquisition); Saint Sebastian; and King Fernan Gonzalez. Fifth row: unidentified woman; Calderon De La Barca; the immaculate virgin Mary; rosary Jesus on the cross; Rodrigo Ximenez de Rada; and the Battle of Lepanto. One thing Americans who are just learning about 20th century history may ask is: why was the Fascist government of Francisco Franco allowed to remain in place after the defeat of the other fascists in World War II? Of course, it is complicated, and the first level answer is that Spain never went to war with the Allied Powers, even though it was allied with Italy and Germany. Neutrality saved Franco (which pissed off Hitler, who expected better from his fellow Roman Catholic). But important, perhaps more important, was the place of the Roman Catholic Church in United States politics. The Democratic Party from about 1880 to 1970 had two major factions. One was the white, racist, mostly Protestant southern democrats. The other was Northern democrats, a majority of whom were Roman Catholic. Many leading (and following) American Roman Catholics had supported Hitler, Mussolini, and Franco before World War II. When the U.S. entered the war they had to do an about face. Suddenly Hitler and Mussolini, who had always been Roman Catholics, were the atheist enemy. While this happened most quickly in the U.S., the Pope and Vatican hierarchy also quickly came to understand that with America in the war their plan for a Roman Catholic Europe and conquest of Russia, followed by world dominion, might not work out. The Pope (Pius XII) began to hedge his bets. But the Pope and American Catholics were able to save fascism and General Franco in Spain. Franco continued to jail and kill anyone who opposed him until the day he died. He did not just murder communists and anarchists. He made the Roman Catholic Church the only legal religion, even going so far as to ban protestant versions of the Bible. Recently the Spanish people, through their government, decided to remove Franco's body from his monumental grave.